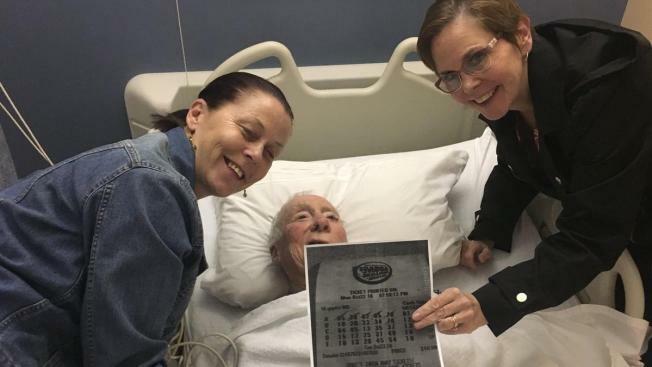 A New Jersey man literally got a lucky break after he fell into a hospital office pool that ended up winning a $1 million lottery ticket. A New Jersey man literally got a lucky break when he joined a $1 million-winning lottery pool at a local hospital after breaking his hip while walking to buy a ticket. Earl Livingston, 87, of Blackwood, New Jersey, was walking to the store Tuesday to pick up a lottery ticket when he fell and broke his hip. He was taken to Jefferson Stratford Hospital, where he shared his story with staff members. A physician’s assistant welcomed Livingston into the hospital’s lottery pool along with 141 others. That pool ended up including a winning, $1 million ticket purchased in Lindenwold, New Jersey. Members of Jefferson Stratford Hospital in New Jersey pose after winning $1 million in the Oct. 23, 2018 Mega Millions drawing. Livingston will need a hip replacement. But he has a nice remedy for the pain thanks to a kind hospital staff and a little bit of luck.